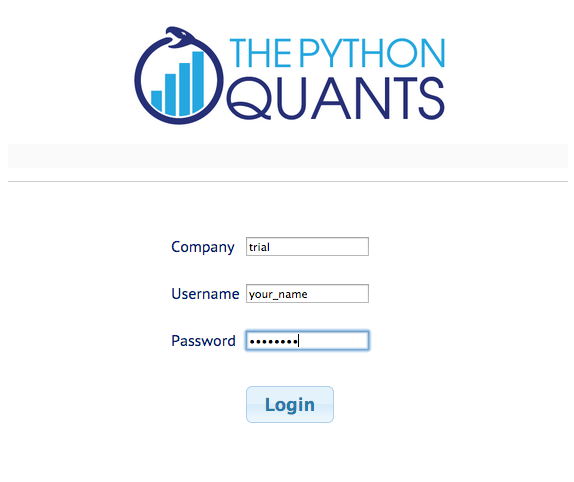 The Python Quant Platform is developed and maintained by The Python Quants GmbH. It offers Web-/browser-based data and financial analytics for individuals, teams and organizations. Free registrations are possible under http://trial.quant-platform.com. You can freely choose your your_user_name and password. 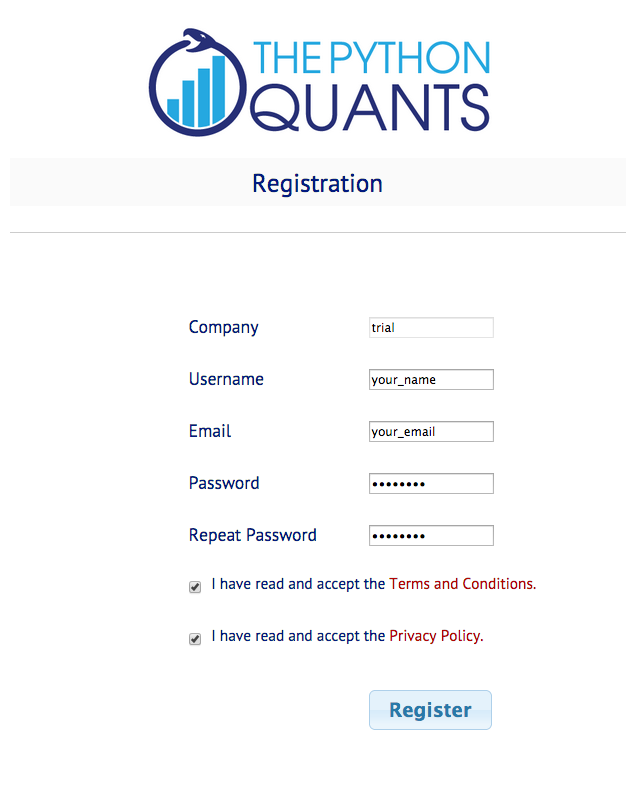 You can then login under http://analytics.quant-platform.com, using trial as company in combination with your_user_name and password. Please note that trial/test accounts are only for illustration purposes and they can be closed at any time (with all data, code, etc. be permanently deleted). If you have questions about the platform or any troubles, you can reach us under platform@pythonquants.com. Other Data Science Languages: you can also use R or Julia on the platform. Full Fledged Code Editing: there is a code and text editor available which support the most common languages, among others, by syntax highlightling. Application Development & Deployment: you can not only do interactive data and financial analytics, you find everything to develop real (Web-based) applications and to deploy them. Platform Deployment: the platform is easily scalable since it is cloud-based and can also be easily deployed on your own servers (via Docker containers). In the left panel of the platform, you find the current working path indicated (in black) as well as the current folder and file structure (as links in purple). Note that in this panel only IPython Notebook files are displayed. Here you can navigate the current folder structure by clicking on a link. Clicking on the double points ".." brings you one level up in the structure. Clicking the refresh button right next to the double points updates the folder/file structure. Clicking on a file link opens the IPython Notebook file. You find a link to open a new notebook on top of the left panel. 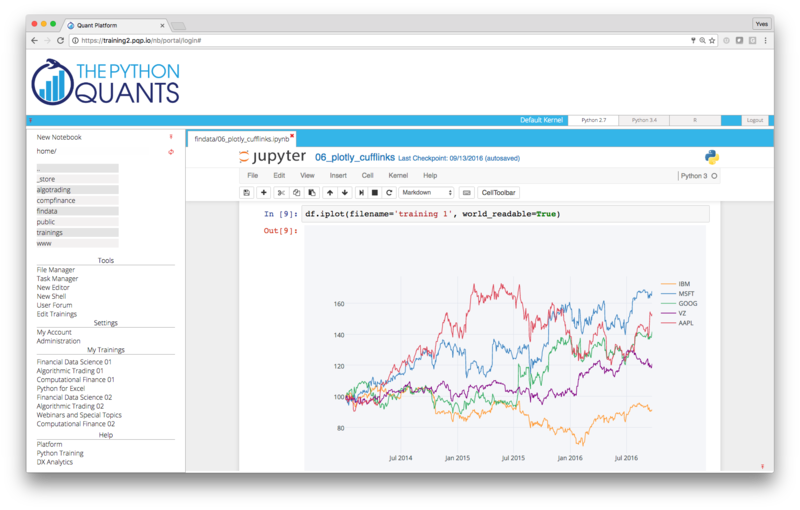 With IPython notebooks, like with this one, you can interactively code Python and do data/financial analytics. If you are new to IPython Notebook, you could start on the IPython home page and might want to check out the videos that are linked there (cf. video page). Combining the pandas library with IPython Notebook makes for a powerful financial analytics environment. 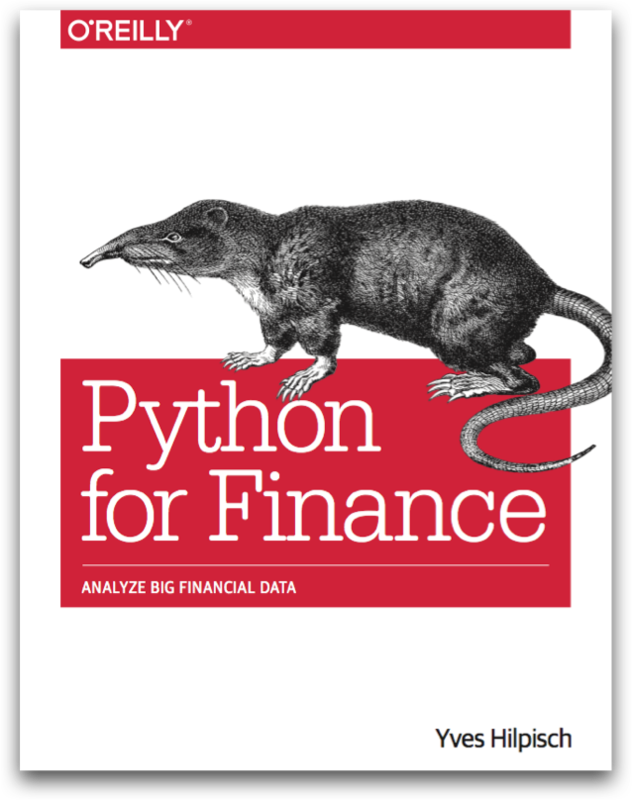 Below you find a complete talk/tutorial about interactive financial analytics with Python. Loading the R extension for IPython. We are going to generate a Vega surface for one risk factor with respect to the initial values of both risk factors. The File Manager allows the easy, GUI-based file management on the platform. In the left column you can navigate the file system. For instance, you find a folder called public which you can use to share files with others. Via a double click on a file, you can open and edit it (for those files where it is possible, e.g. Python, HTML or CSS files). All file operations are only implementable based on the respective user's rights on the operating system level. For example, everybody can copy a file to the public folder. This file can then be read and executed by everybody, but only the "owner" of the file can overwrite or delete it. This component of the platform allows the editing of a multitude of different file types (e.g. Python, HTML or CSS). This component of the platform allows the shell-based access to the Linux server. This part of the platform requires a separate login for security reasons (credentials available upon request). 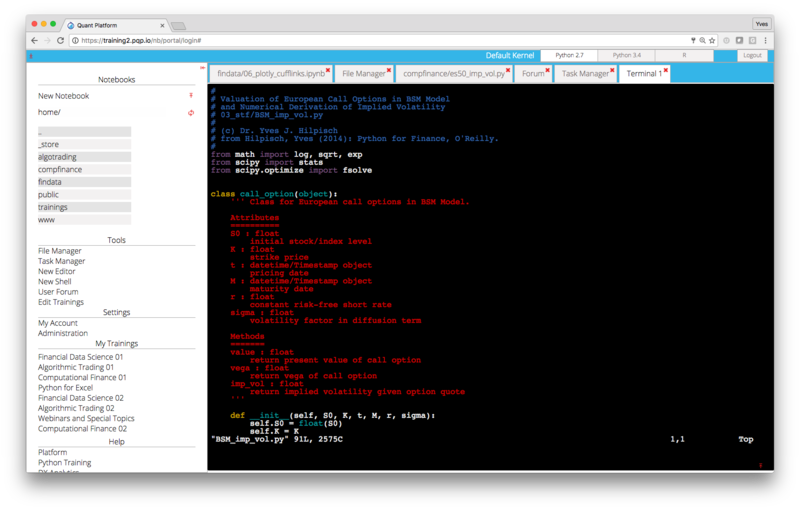 For example, you can also interactively code on the shell via IPython Shell. The IPython Shell version is started by simply typing ipython in the system shell. Via the system shell you can of course edit and kind of text document and file with computer code, e.g. Python. To this end, you can use Vim which is started via typing vim filename on the system shell or alternatively Nano (started by nano filename). 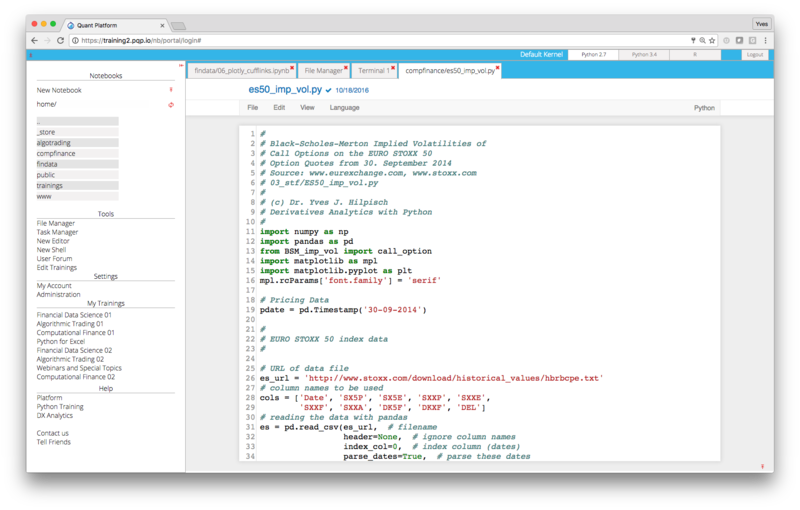 Via the Python Quant Platform you can develop and deploy also your (Web) applications. Here is an example that shows real-time streaming of financial data. The Python Quants group – i.e. The Python Quants GmbH, Germany, and The Python Quants LLC., New York City – provide consulting and development services with a focus on Python for Finance. The team consists of Python and Financial experts with comprehensive experience in the financial industry and in particular in the Quant Finance space. 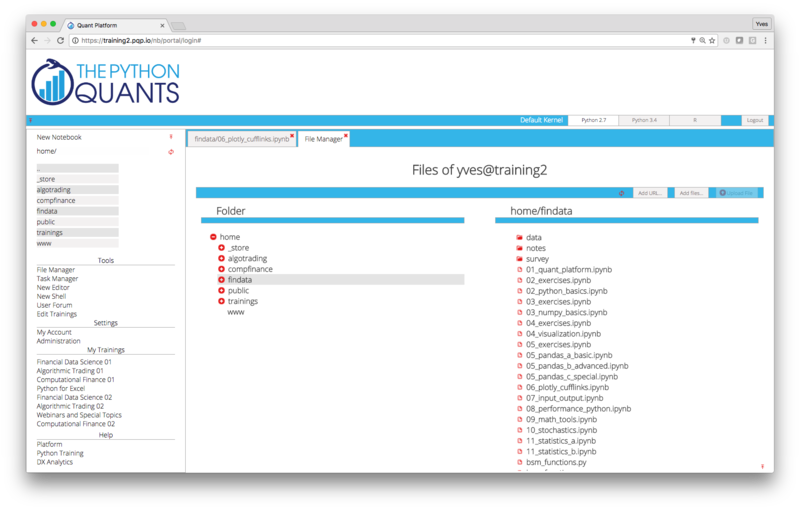 During trainings, the Python Quant Platform is used for a frictionless start and a highly interactive, collaborative training experience. There is also a complete Python for Finance Online Course available under http://quantshub.com. See the trailer of the online course below. There are two books available from The Python Quants group about Python for Quant Finance. If you are working in (Quant) Finance and want to use Python for developing interactive analytics workflows or more complex financial applications, then this book is the right source for you. You can order at it at Amazon or at O'Reilly. 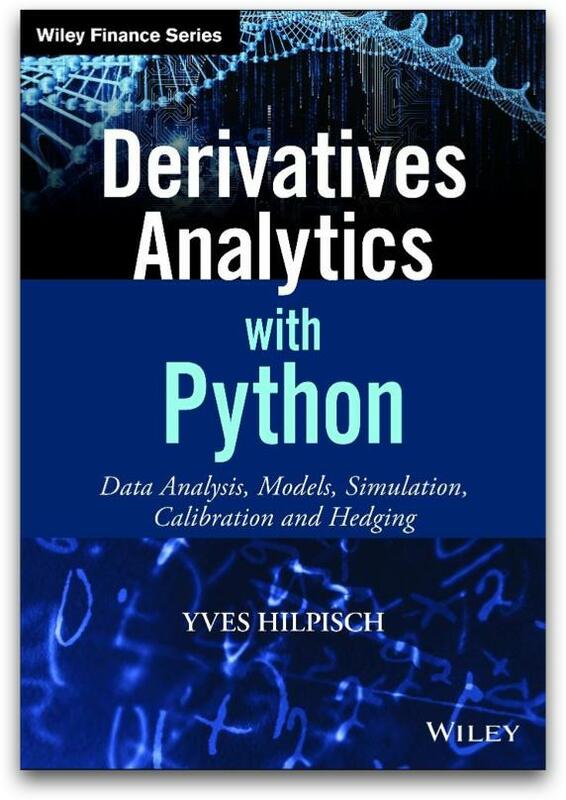 The other book by The Python Quants group is about advanced, market-based derivatives analytics and uses Python to illustrate and implement all numerical methods introduced (Fourier-based option pricing, Monte Carlo simulation, option model calibration, hedging). The book will be published in 2015 by Wiley Finance. See the Wiley book page. The Python Quants also organize the largest "For Python Quants" conference in the world. At the recent NYC conference in March 2014, more than 220 people have been in attendance (cf. http://nyc2014.forpythonquants.com). The last one took place in London on 28. November 2014 (cf. 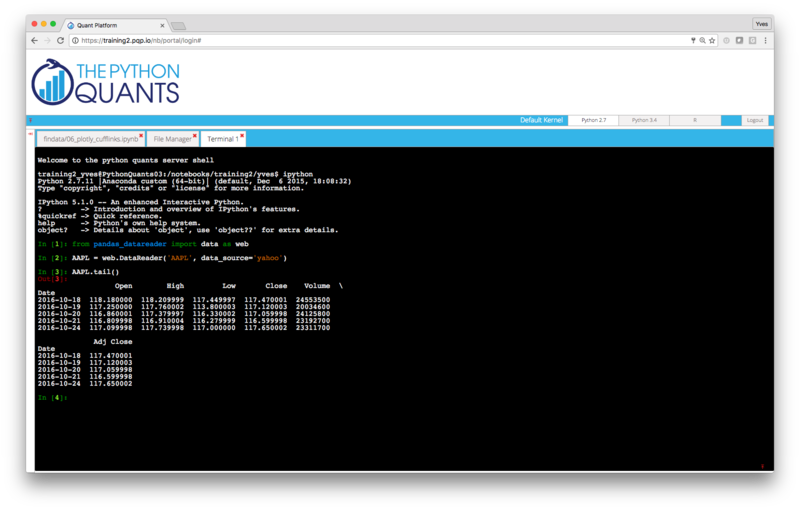 http://lon2014.forpythonquants.com).